I just reunited with my mentor after very long years and there I got the idea that I could redesign one of those old crappy wallpapers which I made back in the years when I started my walling career. It would be a good chance to show him how my skills improved in those 6 years. Unfortunately the original scan is now lost with the shutdown of AnimePaper and I scrapped the original description without reading it. Guess why, heh? I made the original release back in 2008 and wasn't bad for that time, but just as skills grows, grows also the dissatisfaction from your older submissions. So ladies and gentlemen, I present you the 2014 version of... oh my, even the title changed... so rather I make a list of changes. - Aspect has been changed from 4:3 to 16:10 widescreen. - Characters have been completly revectored, extended and outlining was changed. - Gradients and effects are used now instead simple overlays. 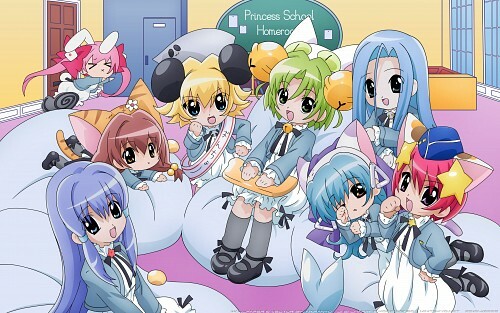 - Title has been changed from "Princess School Class" to "Princess School Homeroom". - Colors are now more vibrant and more toned. - To fit 16:10, Rabi en Rose, Rinna Charat and Meek Charat have been extended to full characters. Completly drawn from my imagination. Hope they don't look that bad. Lol. - Aqua and Yurei have now detailed eyes just as the others, despite that not even the anime features it. - Yurei now has light in her hair, which is neither present in the anime. - Meek now has a visible school crest. - The background now goes with the anime instead basing on the original scan. Details bellow. - The font on the board has been changed to PreCursive. - Board now has some papers hunged on. - Windows changed to two huge ones from the original small one. - Shelves now have boxes and books. - The locker has been changed to the teleporter where Akari dissappears after the class ends. - White ornaments now where the pink ground and yellow wall meets. of the favs what I got for the old much worse one before. I also left the old date as of nostalgy. You should have put ten characters in :D to symbolize your ten wallpapers. Haha. Anyways, nice work. very very cute and nice too ^^ + fav! Great job! I love Puchiko, she's so adorable.